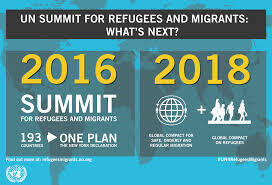 The first formal consultation in relation to the zero draft of the Global Compact on Refugees took place in New York in February. – to support conditions in countries of origin to facilitate return in safety and dignity. – how to facilitate greater investment and involvement of different stakeholders in responding to mass movements of people in the future. The draft Compact will form the basis of formal consultations with Member States led by the UNHCR, between February and July of 2018. These consultations are intended to result in the formulation of a final text of the Compact, to be presented to the UN General Assembly later in 2018.